pork chops, vegetables, fruit, grains and most breads, but the aroma of frying bacon can rouse me from a deep sleep. My love of breakfast started young. Mama cooked for us kids most mornings. We didn’t always have meat with every lunch or dinner but for breakfast, we’d have bacon, sausage or ham. Sometimes she’d send me out to the chicken pen to gather eggs. The roosters and hens fussed when you entered the henhouse. Every now and then, I’d have to reach under a fat hen to get eggs. There’s an art to sneaking eggs from beneath a nesting hen without getting a face full of claws and feathers. The eggs were warm to the touch. Mama’s gravy didn’t look like what you get at Jack’s or Mickey D’s. Her gravy was the color of bisque with flecks of black pepper. Jilda’s mom made great biscuits, but my mom’s biscuits were different. She would scoop a glob of lard the size of a tennis ball and plop it in a cast-iron skillet with dappled sides from years of use. She’d set the skillet on the small eye of the electric stove to melt the lard while she mixed biscuit dough in an ancient white-speckled bowl. When the lard melted, she’d place 10 biscuits in the skillet with one in the middle that looked as big as a hubcap to my hungry eyes. Once out of the oven, they had golden tops, with a bottom crust as brown as a graham cracker. The biscuits crunched slightly as you chewed, which added a pleasing texture that went well with fried eggs and gravy. On mornings when we had ham, she’d make redeye gravy, which raised the experience of biscuit sopping to a new level. For variety, we’d sometimes have grits instead of gravy. The dollop of freshly churned butter in the pile of grits on my plate was as yellow as an egg yoke. I became a coffee drinker before I started to school. She’d pour the morning nectar in my cup with a spoonful of sugar and enough cream to make it look like caramel. The kitchen at the old place had a curtain-less window the width of our sink. On the sill, she had flowers and green plants that grew year around. The light coming through the windows made our kitchen feel like a happy place. You might not be surprised to learn that the idea for today’s column came to me when Jilda asked if I’d like biscuits and gravy for breakfast. We usually have cereal or a blueberry-protein shake, but she cooks a mean breakfast that’s a rare treat for us. I took my laptop to the screened porch and when the timer chimed announcing the biscuits were ready, I’d finished this piece. 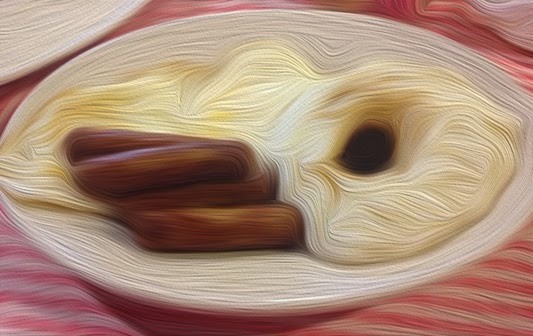 I hope you get a chance to enjoy a nice country breakfast soon. Actually, I'm meeting my girlfriend for breakfast at the diner up the road. Country breakfast! We wore them off when we were kids, didn't we. A delicious breakfast is always welcome around here...we usually skip lunch on those days! It's funny because my father gave us coffee with plenty of sugar and cream or milk when we were little as well. I was drinking coffee very early on, and I love it to this day, although I drink it black now. It reminds me of my dad...he was a character and so full of life! Damn this post made me hungry Rick! And here it is still over an hour away from my lunchtime at work. Thanks a lot! Breakfast is awesome. I love a good ole' country breakfast. Biscuits and gravy is the best. My mamaw used to make some AMAZING sausage gravy. Ah the memories. And she could fry up some awesome bacon. When I was in Germany in April, Beate made blueberry pancakes and they were freaking amazing. I need to stop typing because I am drooling a bit. Dear Rick, I'm a vegetarian now and have been for 33 years, but your posting brought vividly back to me the aroma and the taste of breakfast: biscuits, gravy, bacon, sausage, and potatoes. Of course, most of us feel that the cooking done by "our" mom was the best. We rate everything by that standard, but oh, you made me hungry to taste your mom's biscuits! Thank you for this wonderful posting! Peace. Yup, Breakfast is the best meal of everyday!! Fresh eggs daily and BACON is not meat Right!! Mmmmm. I have chocolate milk for breakfast, or a protein shake. My stomach has to awaken slowly. Last week I had to fast for 12 hours before having blood drawn first thing in the morning. That day I broke my fast in a restaurant with eggs and bacon and French toast. I couldn't remember the last time I'd had French toast. I love the way you describe the food and your mama's cooking. I'm starting to wish for another blood draw so I'll need breakfast afterwards. Thank you Jilda!!! Motivation that made my mouth water. I love breakfast, too. Yummmmm.